Tuesday’s election, Robert Wright has you covered. All the reasons to be a worrywart are here. President Obama is peeling away. As you can see from the electoral vote (EV) estimator, he is the candidate with the momentum, not Romney. 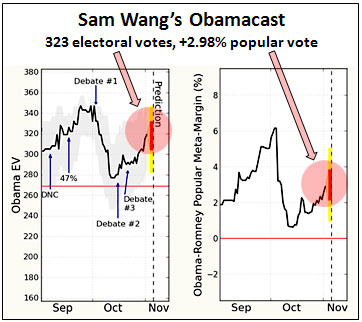 In terms of EV or the Meta-margin, he’s made up just about half the ground he ceded to Romney after Debate #1. And the indicators are still headed straight up….A few days ago, the word was that Team Romney was buying ads in Minnesota and Pennsylvania. If he wins either of those states I will eat a bug. Ohio…a really big bug. And yes, I will post a photo. So there you have it. This is a full service blog: we give you reasons to worry and reasons to hope. The rest is up to you.